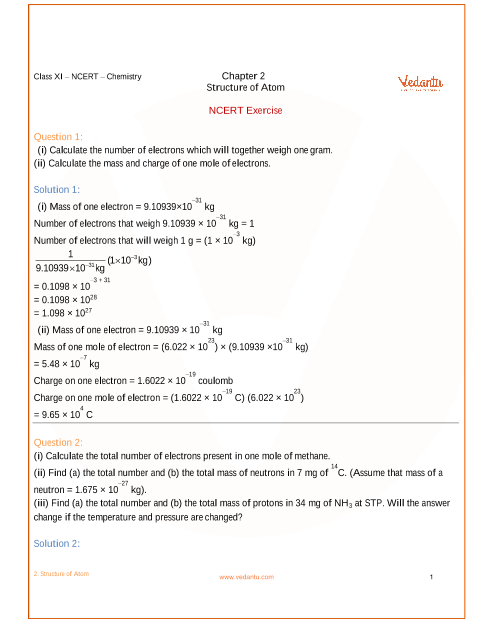 Vedantu.com - No.1 online tutoring company in India provides you Free PDF download of NCERT Solutions for Class 11 Chemistry Chapter 2 - Structure of Atom solved by Expert Teachers as per NCERT (CBSE) Book guidelines. All Chapter 2 - Structure of Atom Exercise Questions with Solutions to help you to revise complete Syllabus and Score More marks. Register for online coaching for IIT JEE (Mains & Advanced), NEET, Engineering and Medical entrance exams. NCERT Chemistry Grade 11 Chapter 2, Structure of Atom belongs to Unit 2 of the syllabus. Unit 1, Some Basic Concepts of Chemistry and Unit 2, Structure of Atom hold a weightage of 11 marks in the Grade 11 final examination. In this chapter the student will learn about the discovery of electron, proton, neutron and their characteristics, description of Thomson, Rutherford and Bohr atomic models, important features of the quantum mechanical model of atom, nature of electromagnetic radiation and Planck’s quantum theory, photoelectric effect and features of atomic spectra, de Broglie relation and Heisenberg’s uncertainty principle, atomic orbital in terms of quantum numbers, Aufbau principle, Pauli exclusion principle and Hund’s rule of maximum multiplicity and how to write electronic configuration of atoms. The students will also learn about Charge to Mass Ratio of Electron, Charge on the Electron, Atomic Number and Mass Number, Isobars and Isotopes, drawbacks of Rutherford Model, developments leading to the Bohr’s model of atom, wave nature of electromagnetic radiation, particle nature of electromagnetic radiation, Bohr’s model for hydrogen atom, explanation of line spectrum of hydrogen, limitations of Bohr’s model towards quantum mechanical model of the atom, dual behaviour of matter, quantum mechanical model of atom, orbitals and quantum numbers, shapes of atomic orbitals, energies of orbitals, filling of orbitals in atom, stability of completely filled and half-filled subshells. NCERT Chemistry Grade 11 Chapter 2, Structure of Atom will help the students to strengthen their concepts about the structure of an atom so that they can score well in the Board Examination, JEE, NEET, AIPMT and other tests. Get 100 percent accurate NCERT Solutions for Class 11 Chemistry Chapter 2 (Structure of Atom) solved by expert Chemistry teachers. We provide solutions for questions given in Class 11 Chemistry text-book as per CBSE Board guidelines from the latest NCERT book for Class 11 Chemistry. The topics and sub-topics in Chapter 2 Structure of Atom are given below. Ex 2.6.6 - Stability of Completely Filled and Half Filled Subshells. Chapter 2 - 67 Questions with Solutions. Other than given exercises, you should also practice all the solved examples given in the book to clear your concepts on Structure of Atom. Download the free PDF of Chapter 2 Structure of Atom and take the print out to keep it handy for your exam preparation.